Our mission is to connect consumers with healthy, sustainable, fresh foods. We will achieve this by aggregating producers and providers of sustainable food by geographic market and building an archive of those producing and serving the finest sustainable foods. We will be a resource for those who harvest, prepare or consume sustainable food. 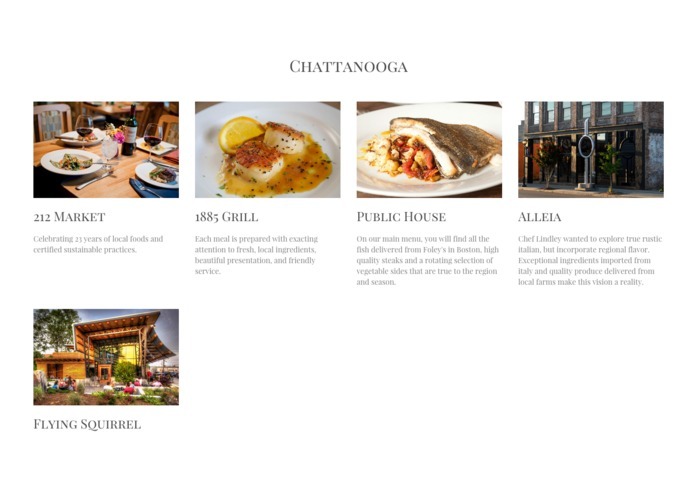 We will: -Focus initial growth on Chattanooga and Baltimore partnering with the aquariums for educational and promotional support and local fisheries, purveyors, and farmers to identify restaurants serving their sustainably produced foods. -Partner with local farms, fisheries, dairies, and suppliers to provide resources for restaurants who would like to provide sustainable dining options fostering a collaborative community. 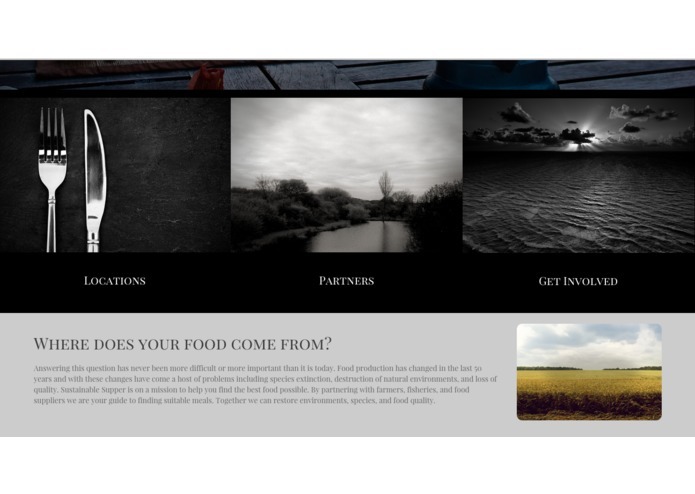 -Partner with chefs, farmers, and experts in the field of sustainable food to develop criteria to rate producers and restaurants on. 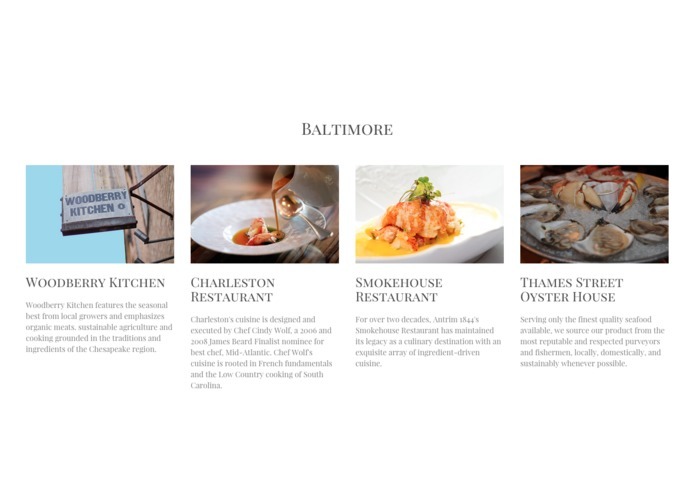 -Partner with individuals in specific cities to crowdsource restaurant and supplier recommendations and reviews. This community will fuel growth to other cities. 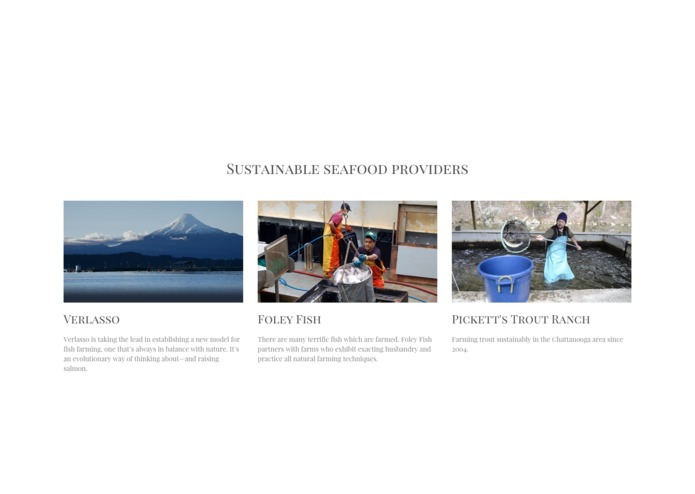 -Partner with organizations such as Riverkeepers to align with social causes and build communities gaining further knowledge of regional suppliers and restaurants. -Secure corporate sponsors such as Patagonia to promote our efforts and connect with communities around the globe aligning with corporate social goals. -Foster community through social media, blogging and video series founded in education and promotion of sustainable food. -Partner with the State Department and other organizations to promote sustainable food production and sustainable dining choices. Long term we plan to provide consumer resources for sourcing sustainable ingredients from local markets and suppliers, expanding on recipes provided by aquariums and organizations advocating sustainable food. I collaborated with Ben to develop our concept. 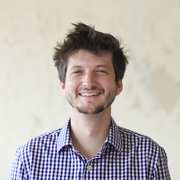 I aggregated content for the site and developed our growth strategies and messaging. I also coordinated with National Aquarium in Baltimore and presented at both Hackathons. I am a Marketing Strategist with experience in branding, advertising, web development, and strategic communication.